The Franco-Prussian War 1870-71 was one of the most significant wars of the nineteenth century. It changed the balance of power in Europe and resulted in the relative decline of France and confirmed the rise of a United Germany as the major power on the continent. This war had enormous implications for international relations not only in Europe but around the Globe. The Franco-Prussian War laid the foundation for the First World War. In 1870, France was regarded as the most powerful country in mainland Europe, and the authoritarian Emperor Napoleon III ruled it. He had actively sought to expand French influence in Europe and around the world. Napoleon III inspired by his grandfather Napoleon I sought to make France the greatest nation in Europe. He had fought wars against the Russian Empire in the Crimea and Italy against the Austro-Hungarian Empire. The Emperor was also acquiring colonies in Asia and Africa . Germany at this time was still divided among various, often small principalities and dukedoms. Prussia was the most powerful German state, and under the leadership of Chancellor Otto Bismarck, it sought to unify Germany under its leadership. Bismarck had cleverly engineered wars with Denmark and Austro-Hungary, which resulted in Prussian coming to dominate the Northern German States. Bismarck sought to unite the Southern German states under the leadership of Germany. However, Bismarck, knew that France would resist this, as Napoleon III, did not want a strong and united Germany on its borders. The origins of the Franco-Prussian war were a direct consequence of the rise of Prussia and its growing influence in Germany. After Prussia had defeated Austria in 1866 at the Battle of Sadowa, ‘it seemed that it was only a matter of time before they brought all the German states under the control of Berlin.’This would have been disastrous for France. 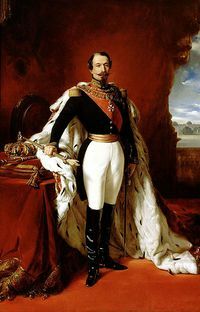 Napoleon III ordered a rapid expansion of his armed forces in 1866 and this significantly added to tensions with Prussia. 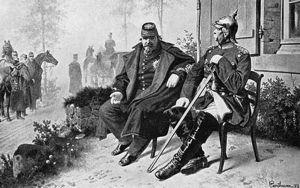 Many in Berlin, the Prussian capital believed that war with Napoleon III was inevitable and desirable to achieve German unity. Many historians believe that Bismarck created a diplomatic crisis to engineer a war with France. A Prussian prince was one of the candidates for the Throne of Spain. However, France feared encirclement by Prussia and forced the prince to renounce his claims, to the Kingdom of Spain. This was a national humiliation for Prussia. Bismarck, wanted a war with France and so devised a plan to provoke France into declaring war on his country, he changed a telegram sent by the Prussian King to Napoleon III, to make it appear insulting. This became known as the Ems telegram. The French public were enraged, when Bismarck made public the telegram, and the government in Paris declared war on Prussia. The French army advanced into the Rhineland and captured the German city of Saarbrucken. The army of Napoleon III was ill-prepared for war as many of its best troops were fighting in the colonies, such as Algeria and Vietnam. Alarmed at the French invasion, the southern German states eventually put their armies under the command of the Prussian Army. Suddenly, France was faced with a united Germany, under the leadership of Prussia. The German forces, under the command of Field Marshal Helmut Von Moltke, gradually pushed the French army back into eastern France. Gradually, a large section of the French army became encircled in the city of Metz. The French public was alarmed at this and demanded the lifting of the siege. A large French army was assembled and advanced to break the German siege at Metz. The French as they advanced towards Metz were lured into a trap at Sedan by the Prussian and German forces. The French army suffered a catastrophic defeat at Sedan and this battle decided the war in Prussia's favor. France had lost most of its army and was defenseless before the German army. During the battle, Napoleon III was captured by Prussian forces. The war continued, and the French refused to surrender. Napoleon III abdicated and he was replaced by a government of National Defense, who carried on the war. The Germans advanced to Paris and besieged the city, where the Prussian Kaiser was crowned the monarch of a united Germany in Versailles. The Government of National Defense, after increasingly heavy French losses during the siege of Paris, accepted the inevitable and agreed to a Peace Treaty with the newly created German Empire. The Franco-Prussian war was a resounding victory for the new German Empire. Germany was united under Prussia, after the war and was the largest and most populous state, apart from Russia. Eventually, Germany withdrew from most of France, although they annexed the French provinces of Alsace-Lorraine. France was also expected to pay reparations to the new German state. Germany’s emergence as the most powerful state in Europe was to change the balance of power in Europe in the decades that followed. Germany had replaced France as the leading nation in continental Europe and, under Bismarck, established good diplomatic relations with Russia and Great Britain, to secure its position. France and Germany remained enemies, even after the ending of hostilities. French public opinion was very nationalistic and anti-Prussian and was determined to avenge the defeat in 1870-71. The country gradually rebuilt its power by creating a vast Empire in Africa and Asia and this alarmed Berlin. Germany and France began to gather allies in the belief that one day that there would be another Franco-German war. By 1900, Europe was divided into two hostile alliances, one that was led by Germany and the other that was led by France. Europe was divided into two hostile power blocs because of the bitter Franco-German rivalry. The 1870-71 war resulted in two mutually hostile powers in Europe, and this was to lead to two rival alliances on the continent ultimately. This antagonistic rivalry was perhaps the most significant factor in the outbreak of the First World War. The Franco-Prussian War decisively changed the balance of power in Europe. The origins of the war lay in the process of the unification of Germany. Bismarck provoked a war with France in order to complete the unification of Germany. The aftermath of the war, was the fall of Napoleon III and left Germany as the most important state in Europe. However, the growing power of Germany eventually led to the formation of two opposing alliances. The Franco-Prussian War ‘led to a united Germany, but a more divided Europe’ and this ultimately led to the great catastrophe of the First World War. ↑ Wentzel, David (2003) A Duel of Giants: Bismarck, Napoleon III, and the Origins of the Franco-Prussian War, p. 12. ↑ Taylor, A.J.P. (1987). The Struggle for Mastery in Europe 1848–1918, p. 345. ↑ Rich, Norman (1991) Great Power Diplomacy: 1814-1914, p. 156. ↑ Clark, C. (2006). Iron Kingdom: The Rise and Downfall of Prussia, 1600–1947, p. 345. ↑ Wawro, G. (2003). The Franco-Prussian War: The German Conquest of France in 1870–1871. Cambridge: Cambridge University Press, p. 167. ↑ MacMillan, Margaret. The War That Ended Peace: The Road to 1914 (2013). This page was last edited on 28 November 2018, at 15:52.